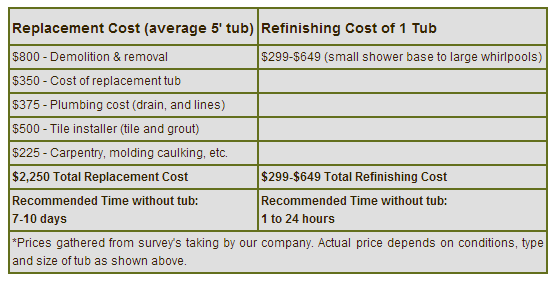 Bathtub & Tile Refinishing, Reglazing, Resurfacing Systems, Local Windsor/Essex, bathtub refinishing and bathtub reglazing is the most affordable bathtub solution, a new bathtub completed in one day! Over time, bathrooms and bathtubs can look old, tired, even ugly. Whether it’s chips in the glaze of your bathtub, outdated colors or tile you simply can’t stand, we can make your bathroom and bathtub shine again with our specialized refinishing and reglazing systems. This system renews the top layers of the existing bathtub, with our unique Bullet Proof Acrylic Polymer coating, your tub will be brand new again! Leave us a quick message? Specifics of your project or a question? ﻿Job completed in one day!